Digital Asset Management on Cloud Belongs to the Field of Content Management Systems and Can Be Delivered as SaaS or Used on IaaS or Private Cloud. Digital Asset Management on Cloud, hence can be perceived either as a Service or Set of Softwares – from the system Administrator or CIO’s point of view. However, Digital Asset Management on Cloud or rather the topic Digital Asset Management is not easy topic. Digital asset management itself is the management and decisions surrounding the cataloguing, storage, retrieval and distribution of digital assets. Digital Assets can be Videos and Other Media File to Text files. Enterprise Content Management (ECM) is the organization and storage of a company’s documents and other content, related to business processes which encompasses the strategies, methods and the tools used for the content. Broadly, Digital Asset Management includes all the protocols for downloading, grouping, archiving, optimizing, maintaining, importing, and exporting the files. Media Asset Management (MAM) and Video Asset Management (VAM) are two other derivative terminologies. In short, as there is the possibility of using a Web GUI based usage on Server – we can either install Free / Open Source Software on IaaS or Private Cloud or Hybrid Cloud or can use some third party service – that is basically a SaaS. So, from the usage point of view; Digital Asset Management on Cloud can have two faces – the software itself and the service. In certain cases, we prefer SaaS over IaaS, like for Email – because the setup of White Labelled Domain Named Email is difficult. ERP is often used as SaaS. These, indeed related to the company’s need. As the consumer or users of Digital Asset Management is too much varied, which can be simple management of video files to complex 3D Medical Data (compliant to 3D Medical IEEE Standards); the need of solution – whether a SaaS or Free Software; also varies widely, somewhat like that of email. In general, Digital Asset Management on Cloud as Self Hosted Software is complex, costly and demands both manpower and efficient Linux Administrator for the backend. For video or digital arts, usually Adobe’s service is used for unified management. Concerto is an Open Source Software which can be installed on server whereas for Brand Asset Management, CleanPix like solution can be used depending on the need. Expenditure of $300 per month for Server Backend does not gives quite smoothly running backend for huge amount of data management. A single Bare Metal instance will cost $500 per month from IBM, HP Cloud or Rackspace. As we are NOT endorsed by any company, we can not list hundreds of paid services related to Digital Asset Management for free without testing. Review for paid services is after payment or our usage for own need. Digital asset management part of the files can be addressed manually or automatically. Some systems are open to external vendors or service providers, so that a simple exchange of data in the context of the production is faster. Digital asset management can be composed of various individual components, computers, storage systems etc. Printing industry to manage layouts, custom logos, images, photos etc. Marketing and press departments in companies in the advertising industry, NGOs etc. Basically, for Content Management System, grossly the need is of less variety. Typical revision control software like feature might be needed by one segment, while for the others; integration of a Third Party software will be needed. 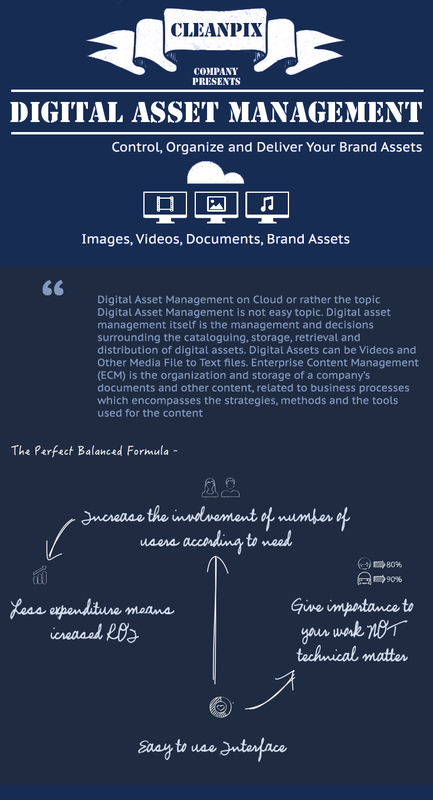 Need of a Digital Asset Management System with less complex need are easier to categorize. This is for the systems related to the audio or video production. They, for example can have dedicated I/O for the asset ingestion, usage and outgest. Metadata can serve as a guide wire to the software system. These cases are of partially shared Hybrid Cloud in function. From the file management point of view, most files can be treated as a general blob (binary large object). That is, non-database data. In case of a typical Content Management System, the application server / database server is the main server. For the complex need, optimization of own server can be proved to be challenging. This Article Has Been Shared 5992 Times! Cite this article as: Abhishek Ghosh, "Digital Asset Management on Cloud," in The Customize Windows, February 16, 2015, April 23, 2019, https://thecustomizewindows.com/2015/02/digital-asset-management-cloud/.